What does America’s economic recession have to do with a school teacher in Kenya? A lot more than you realize. If there’s one thing I learned at the World Bank’s World AIDS Day event yesterday, it’s that our lives, economies, and health are all inextricably intertwined on a global scale. Beldina Atieno (second from the left in the photo) traveled all the way from Nairobi to offer her first hand account of life as an HIV+ school teacher in Africa. Ms. Atieno’s story was both heart-wrenching and eye-opening. She was first diagnosed after her youngest daughter became very ill from an opportunistic infection, which prompted HIV testing in both daughter and mother. After discovering that they were both positive, she was abandoned by her husband and was plunged into poverty and despair. I was struck by the horrific reality of Ms. Atieno’s life choices: starve now, or die of AIDS later. She, and others like her, make the choice for food above medications every day, as the scourge of HIV continues to ravage lives around the world. Those who have adequate nutritional support and access to HIV medications, often rely on international aid for them. And in these tough economic times it’s hard to make the case for supporting relief efforts when our countries are having a hard time extending healthcare to our own citizens. Ms. Atieno may be the indirect and invisible victim of Wall Street corruption and America’s economic decline. Other speakers at the event had both hopeful and sobering things to say about the global fight against HIV/AIDS. On the one hand, U.S. Deputy Secretary of State, Jack Lew, offered the good news that PEPFAR (President’s Emergency Plan for AIDS Relief – the largest commitment by any nation to combat a single disease in history) countries have experienced a 10% decline in new HIV infections. On the other hand, Ambassador Eric Goosby, US Global AIDS Coordinator, predicted the flat lining of funding for HIV prevention and treatment in the future, due to the economic downturn. “Without a comprehensive strategy to combat HIV/AIDS our economy almost collapsed. We faced serious absenteeism from work, teachers were dying, and so many people struggled with sickness caused by opportunistic infections. 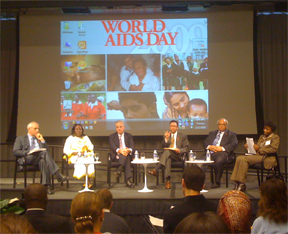 As the event concluded, I mused about the complexity of the global HIV/AIDS dilemma – and the common sentiment expressed by the speakers that the answer must involve everyone from the highest levels of government (those who can continue to allocate or replenish funds) to the community organizers in each country who have a sense of what their local people need most. Because in some cases, the greatest need may not be obvious to those who are not working in the trenches on HIV/AIDS relief. Just ask Ms. Atieno – what she needs most is some rice to go with her ARV medicines.